Num Noms Series 3 - #WhatsYourFlavour On Pancake Day? Home Food Num Noms Series 3 – #WhatsYourFlavour On Pancake Day? It’s Shrove Tuesday, that’s right… the day that you can officially fill up on pancakes, with endless filling possibilities! For me personally, I love simple lemon and sugar pancakes however Mini Me is a fan of chocolate spread and strawberries. As you can see, we got in on the action early and I may have cheated ever so slightly with pre-made pancakes, though warmed up they are easily just as tasty as freshly made pancakes and look just as good! As you can see, we were joined in enjoying our pancakes by Series 3 Num Noms, the latest series added to the range. Just as the possibilities are endless as to pancake fillings, as are the possibilities of mixing and matching Num Noms! The launch of Series 3 and Lights Series 1 has seen the introduction of new food themes and funky characters to add to your collection. The latest stackable Nums arrive with nine new collections with new themes including Marshmallows, Donuts, Fruits, Veggies, Candy and Fiesta Foods – adding even more foodie mix and match ideas! The Noms are either erasers, stampers or dual-flavoured lip glosses and all smell delicious! Num Noms Lights Mystery Pot – SRP £3.99 – Lights Series 1 include Freezie Pops, Snow Cones and Glitter Gummies. Stack the Nums on top of the Noms to make over 300 sweet combinations! Num Noms Mystery Pot – £2.99 (as pictured below) – A mystery Num Nom, includes a Num and a 2-flavoured lip gloss which also works as a pencil topper! Num Noms Starter Pack – SRP £8.99 (as pictured above) – Each starter pack contains three scented Nums, Stamp-it Nom, cup, accessory and collector’s menu. Num Noms Lunch Box Deluxe Pack – SRP £14.99 – Lunch Box Deluxe Packs can be reused as a storage case and include 10 scented Nums, one mystery Num, two scented Nom erasers, stamper and collector’s menu. 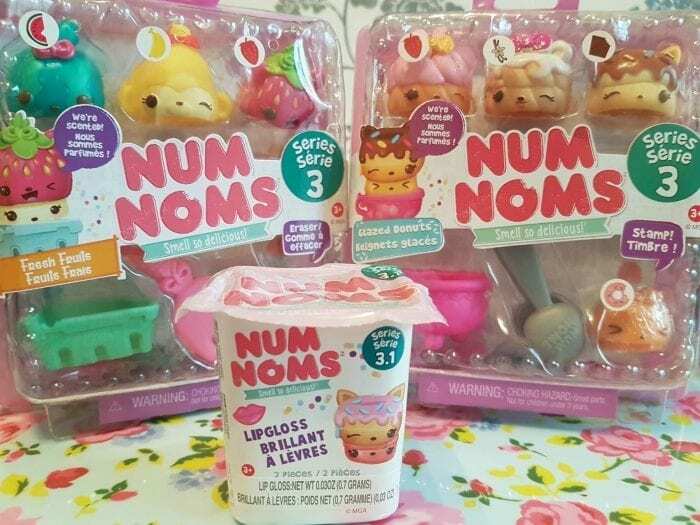 Num Noms Series 3 and Num Noms Series 1 Lights are aimed at children aged 3 years plus and are available from all good toy retailers including ToysRUs, Smyths and The Entertainer. For more information, visit www.numnoms.com or follow Num Noms on Twitter!